Photographer goes ape over monkey selfie: Who owns the copyright? It started as a fun story about a monkey taking a self-portrait but it has come back to bite UK wildlife photographer David Slater three years on. SULAWESI or CRESTED BLACK MACAQUE (Macaca nigra), Close-up portrait self-triggered using a cable release (self-portrait). Sulawesi, Indonesia. Wikipedia’s refusal to delete a link to a freely downloadable image of a crested black macaque monkey has left the Gloucestershire photographer seeking legal advice, claiming it has deprived him of thousands of pounds in lost earnings. The controversy centres mainly on one image (see above) that Wikipedia claims is in the public domain ‘because as a work of a non-human animal, it has no human author in whom copyright is vested’. However, copyright law may be on Slater’s side if, as he claims, he set up the shoot, even though he didn’t physically fire the shutter, according to one copyright expert. Slater says that, at one stage, a monkey did steal the camera and run away with it, but he claims the picture in question was taken after he had set it up on his tripod. Whether or not he set up the shoot could be key to any ensuing legal battle, says photography rights lawyer Charles Swan. Swan told Amateur Photographer (AP): ‘European copyright law requires a photograph to be the author’s “own intellectual creation”. ‘In simple terms, the author has to leave his “mark” on the image. ‘If a photographer sets up a shot, selecting the background etc, with some mechanism (eg. infrared or shutter release) for an animal to trigger the photograph, that is more likely to be considered an original artistic work with the photographer as the author. ‘If he has set up the picture and the monkey has just clicked the shutter, then that could be his copyright, if the resulting picture is what he set up. ‘Who releases the shutter is neither here nor there in that scenario. In 2011, Slater revealed to AP that the shot (one of a series) was – contrary to recent media reports – taken three years before the story hit the headlines that year. He had been using a Canon EOS 5D DSLR camera with a wideangle zoom lens, set on aperture priority mode (at an aperture of f/8). Speaking last night, Slater told AP: ‘I wanted a close-up image but I couldn’t do it. They were too nervous so I had to get them [the monkeys] to come to the camera without me being there and get them to play with the release, which they did. 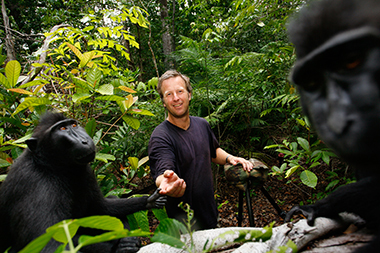 In 2011, Slater said the primates had begun playing around with the remote shutter release as he was trying to fend off other monkeys. Slater believes there is a wider issue at stake in this debate, regarding photographers’ rights. He remains frustrated that he has no control over the image ending up in a brochure, or on a T-shirt somewhere, for example. ‘I’m a professional photographer and I’d like to have an earning from it… how often do these images come along in a photographer’s life? ‘It could be a regular income stream for me. These guys [Wikipedia] have just destroyed it for me,’ he claimed. The Wikimedia Foundation, which operates Wikipedia, has yet to respond to a request for comment. The story first emerged in 2011 when a news agency stumbled across images from a trip Slater had made to Sulawesi, an island in Indonesia, that were taken several years earlier. The macaque monkey could not be reached for comment.